I saw this 2018 Marinaut in Craigslist. $50k for a 1 year old boat with 3 hours. Seems like a good deal. The posting show images from multiple boats. Wonder which one is actually for sale? Certainly there were no 2018 boats built in Washington state. I am not sure if there was a hull which went with the molds, which Ricardo transported to Sarasota--but suspect that there is now one made in 2018 which is not complete yet. When he visited with us last summer, there was a plan to have a boat built by November 2018. I have not heard anything since last summer. My thoughts were exactly what Bob just said. Maybe Ricardo will check in here soon. I sent him an email last October through this site but he has not responded. Wish him well - price seems good although not sure what exactly it includes. The first picture of red boat with Cape Dory name looks like it may be the one for sale<?? The contact name with the phone number is Carlos. The Dark blue hull, red stripe and large round portlight, shown with a black Mercury OB and doing the sweeping curve at speed are pix of the original Marinaut, and are photos I took. That boat has way more than 3 hours on it and was billed as the Marinaut 215. 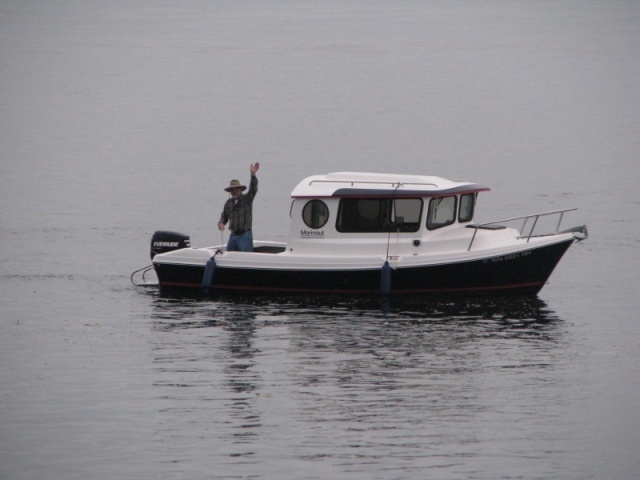 That is OG Dave giving us the wave after several passes for the pix back in Sept of 2010.
it is a very stupid ad with no purpose except to draw someone in..
no engine spec in fact nothing spec'd and a bunch of pictures of other peoples boats. In fact I suspect the picture of the red boat is doctored as it "says" cape dory on the side but it is the pacific northwest in the background not florida. port side cabin window looks doctored also. Scam alert! a hull with no engine, trailer or guts worth 50 K ?? It's fairly common for people to create Craig's list ad using other peoples photos in order to scam people out of money. I'd be VERY wary about this ad. My guess is that there is not a complete 3-hour boat available for that price. This seems like a dealer ad awkwardly presented as a used boat for sale. I just emailed the ad's owner and asked for more info. Let's see what comes back. You could call him too. Yes, but email gets it in print. I had a picture of my boat show up in a craigs list add one time. Scared the c@*! out of me. A kind C-BRAT sent me the notification, and it took me about 4 days to get it all sorted out. Exactly, some guy had a friend do an add for him, and the friend copied the photo from the C-BRAT site. Made me mad that he just stole the photo, and glad that he liked my picture so much. I think Scam is a nice way of putting it. Harvey, the childs pic in my album titled "Spring commissioning time" is Dominique - my cousins grandson. This pic was copied from their family pics on Facebook without any permission given. It has been viewed millions of times many different places with many different captions. Facebook claims there is nothing they can do because of their Facebook "settings". If there is a picture of my boat on Facebook, it was stolen (most likely). Apparently, Billions of online images are stolen everyday. This pic was copied from their family pics on Facebook without any permission given. Actually, if the public was able to view the image, then, it is my understanding that, from a legal standpoint, implicit permission was given when the photo was posted, because the Facebook account was public. There is no legal recourse for the use of public un-copyrighted material. It's very easy to make things private on Facebook, and settings clearly state what things are public or private. Unfortunately many people go online with a degree of naivety that is understandable, but dangerous nonetheless. IMO Facebook should emphasize the consequences of public settings at the outset, when the account is set up. OTOH there are thousands of public forums, like this one, that assume that people realize what public means, and that they will think before they post. If you don't want viewers of a public forum to have the right to copy your images, then you must register the image with the U.S. Copyright Office before you post the image in a public place. If you have done so, you have legal recourse to sue, and no end of attorneys willing to take the case pro bono, because U.S. copyright law requires the offender to pay court and attorney fees, in addition to damages.